May your people exult for ever, O God, in renewed youthfulness of spirit, so that, rejoicing now in the restored glory of our adoption, we may look forward in confident hope to the rejoicing of the day of resurrection. Through our Lord Jesus Christ, your Son, who lives and reigns with you in the unity of the Holy Spirit, one God, for ever and ever. The first reading, taken from the Acts of the Apostles 3:13-15, 17-19, relates the story of Peter and John's meeting with a man crippled from birth who asked them for alms. 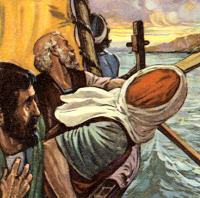 Peter said he had neither gold nor silver, but he would give him something better and proceeded to heal him. The second reading is from the first Letter of John 2:1-5. In this extract the Apostle is urging his fellow-Christians to avoid sin. If they should sin, they are to admit their fault and seek pardon, which will be given in abundance. He has in mind the Gnostic heretics of the time who did not keep God's commandments and yet held that they were not sinning by violating them. John exhorts Christians not to imitate these heretics. The Gospel is from St. Luke 24:35-48. Our Lord's glorious resurrection is the crowning miracle of his sojourn on earth among men. It is the foundation and cornerstone of our Christian religion. His death on Calvary proved that he was really human; his resurrection proved he was also divine. During his public life he had claimed to be God. Had that claim been untrue God the Father could not have raised him from the dead. By his death he made atonement for the sins of the world — "he nailed them to the tree of the cross"; by his resurrection he opened the gates of death for all men and made them heirs to the eternal life. We need hardly delay to prove the fact of the resurrection of Christ, for without it there would have been no Christianity, no Christian Church. In the story of the appearance which precedes today's Gospel, we are told how two of Christ's disciples were so depressed and disorientated by his death that they were giving up all interest in the dead Master and were returning home at the first opportunity (the Sabbath, Saturday, had intervened and they could not travel on that day). The Apostles were no better since Good Friday. They had remained behind locked doors for fear of the Jews. They had no hope left. They too would have left Jerusalem that Sunday were it not for the story brought by Mary Magdalene that Christ's body had been taken from the tomb. When the risen Christ appeared to the ten Apostles (Thomas was absent) they thought he was a ghost, so far were their thoughts from a possible resurrection. When the truth sank into their minds, however, they became changed men. After Pentecost day they fearlessly proclaimed to the Jews, of whom they had been frightened, that Christ whom those same Jews had crucified, had risen and was now glorified by the Father. Thousands of Jews in Jerusalem had come to believe in Christ, because they were convinced he had risen and was the Messiah and the Son of God, as he claimed to be. The four Evangelists testify to the truth of the resurrection and we have the exceptional witness of St. Paul whose radical change of life can have only one explanation — he saw the risen Christ on the road to Damascus. Of the fact of the resurrection we can have no doubts; Christianity is inexplicable without it, and Christianity has existed for almost two thousand years. A more important point for consideration today is what this resurrection means to us. "If Christ has not risen," says St. Paul (1 Cor. 15:17), "vain is your faith, for you are still in your sins." But "Christ has risen from the dead, the first fruits of those who have fallen asleep." Our faith then is not in vain, for the founder and foundation of our faith is the Word of God who cannot deceive or be deceived, and his resurrection is the guarantee of our resurrection. He is the "first fruits," the earnest of the full harvest that was to follow after our earthly death. We shall all rise again, in glory if we have been faithful during our time on earth, in a less pleasant state, if we have not followed Christ here below. Human life has always been the great enigma for philosophers down through the ages. The resurrection of Christ, which causes and guarantees our resurrection, is the one and only explanation of that enigma. If death were the end of man, with all his gifts of intellect and will; if the grave were to enclose forever this noble being whom God has raised above all other earthly creatures and has endowed with super-mundane gifts and aspirations, then indeed man's sojourn on earth would be an inexplicable enigma. But the gifts God gave to man were not simply to help him to make a precarious living and enjoy a fleeting happiness, interspersed with much sadness, for sixty, seventy or even a hundred years. No, they were intended to last for eternity and to reach their real fruition in eternity. With St. Paul then, we may well sing out today: "O death where is thy victory, O death where is thy sting?...thanks be to God who has given us the victory through our Lord Jesus Christ" (1 Cor. 15 : 55-57). Yes, Easter time is a time of rejoicing for every true Christian. It is a time for Alleluias, for praising and thanking God. Our happy future is within our reach. Our eternal happiness has been won for us by Christ and is within our grasp, if only we hold fast to the true faith of Christ, taking the rough with the smooth, going through our lesser Gethsemanes and Calvaries as Christ went through his great ones. If we do this we can hopefully await the angel who will roll back the stone from our grave one day, and allow us to enter into the glory of the eternal Easter in heaven. "I am the Good Shepherd. . .I lay down My life for My sheep. . .but the hireling flees because he is a hireling, and has no concern for the sheep" (Gospel). Jesus organized the visible Church along the lines of a sheepfold. St. Peter, first shepherd of the visible Church, depicts Jesus as the invisible "Shepherd. . .of your souls" (Epistle). He tenderly remembers all that Jesus suffered for us "Sheep going astray." On Catacomb walls, early Christians delighted to draw pictures and to wrote explanations of the perfect understanding and love between the Good Shepherd and His sheep, such as that which exists between the "Father" and "Me." We are not only fed through the visible guidance of His Church, but also through the invisible grace of the Sacraments, especially "in the breaking of bread" (Alleluia Verse).